Make accurate diagnoses by mastering techniques for specimen collection, preparation, and evaluation! Help students face diagnostic challenges with this guide to specimen collection and evaluation! Canine and Feline Cytology: A Color Atlas and Interpretation Guide, 3rd Edition provides a comprehensive overview of diagnostic cytology for companion animals, covering all body systems. Hundreds of photomicrographs show cytology of normal structures to contrast and support identification of cytology of inflammatory, hyperplastic, and neoplastic lesions. Enhancements to this new edition include more histopathologic correlates, expanded immunochemical stains and molecular-based testing to further define the neoplastic cell type, and descriptive schematics that illustrate pathophysiologic concepts. 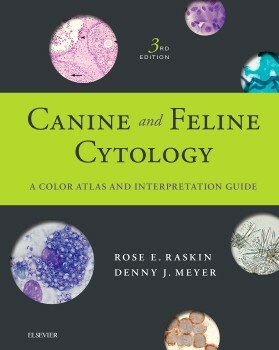 Written by seasoned veterinary cytologists Rose Raskin and Denny Meyer - with over 80 years of combined microscopic experiences - along with 20 expert contributors, this reference offers clear, practical guidelines to sampling procedures, slide preparation, and interpretation leading to diagnoses and/or classification of the cytologic findings. NEW examples and identifiers and a new discussion on artifacts address the latest developments in canine and feline cytology. NEW! Dozens of new images include photomicrographs of blood and bone marrow cytology. NEW! All-new appendix summarizes clinically relevant information on artifacts, special tests, specific characteristics, and much more. UPDATED sampling techniques and examination guidelines include information on how and where to test for specific conditions. Comprehensive coverage of all body systems and body fluids - and the pathological changes associated with various infectious agents - emphasizes areas in which the application of cytology has the greatest diagnostic value. Exceptional-quality, full-color photomicrographs show both normal and abnormal tissue and also include detailed legends. Discussions of clinical, differential, and cytological diagnosis accompany the illustrations of lesions and conditions in each chapter. Helpful hints for improving specimen quality are provided in discussions of common errors and problems encountered in the preparation of cytological specimens. Coverage of histology in organ system chapters demonstrates the histological or histopathologic corollary of cytologic findings. Clear, concise descriptions include sampling techniques, slide preparation and examination, and guidelines for interpretation, leading to accurate in-house and commercial laboratory diagnosis. Easy-to-use, well-organized format includes many tables, algorithms, boxes, and Key Point callouts for at-a-glance reference.